» Handmade clock at The Bridge Cafe Service in Redditch. 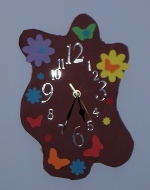 Handmade clock at The Bridge Cafe Service in Redditch. We made this clock at Church today. Not your usual worship activity, but then it’s not a typical church service. This was made at the cafe service at The Bridge Ecumenical Church in Headless Cross, Redditch (formally known as St Luke’s Church). I’ve already written about the church cafe service. The theme was about making time for God, which was perhaps quite appropriate as it has been sometime since we have made time to go to church. Making the clock was an activity that involved the adults and children (rather than splitting into separate sessions as before). The activity was good fun and the whole service was enjoyable. An important thing for us in attending the church is that it’s somewhere that our children can attend with us and that they can enjoy the service as well. Rather than being allocated a “child corner” there is a pile of children’s toys up-front. The service was very welcoming to children and we didn’t feel that we had to try and hush them up or stop them from playing at any time during the service. This entry was posted on Sunday, October 11th, 2009 and is filed under Babies, Children, Crafts, General, kids, kidscrafts, Redditch Worcestershire. You can follow any responses to this entry through the RSS 2.0 feed. Both comments and pings are currently closed.